There aren't many people in the world who can single-handedly move markets. But Warren Buffett is one of them. 1. The Buffett effect: Shares in airplane parts manufacturer Precision Castparts (PCP) are surging by about 20% premarket after Warren Buffett's firm Berkshire Hathaway (BRKB) announced it is buying the company. The deal is valued at $37.2 billion, which includes debt. Berkshire already holds a 3% stake in the company, which is based in Portland, Oregon. Reports had been swirling over the weekend that the sale was imminent. 2. Crude collapse: The price of oil touched its lowest point of the year this weekend, briefly dropping to about $43.40 per barrel. Crude has recovered slightly but is still trading below $44 per barrel. The price of oil has declined by nearly 30% since mid-June. 3. Summer slowdown: It's relatively calm across other global markets. 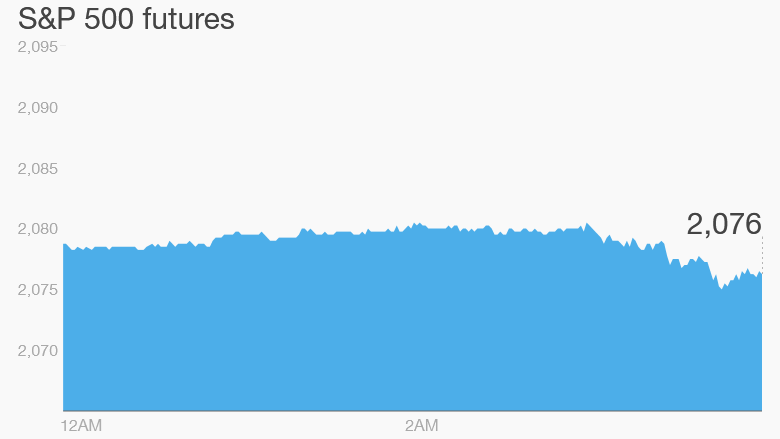 U.S. stock futures are holding steady, and the U.S. dollar is rising against a range of other currencies. European markets are slipping in early trading. Asian markets ended with mixed results, with Chinese stocks surging. The Shanghai Composite shot up nearly 5% Monday after enduring some extreme volatility over the past few months. 3. Earnings updates: There are a handful of major firms reporting earnings after the closing bell, including Kraft Heinz (KHC) and Shake Shack (SHAK). 4. U.S. market recap: The Dow Jones industrial average has now endured seven consecutive days of losses, falling by about 2.2%. Over the last week the S&P 500 and the Nasdaq also declined, down 1.3% and 1.7%, respectively.